The impact of big data analytics on business decision-making will clearly be transformative, but there is a downside. Bottlenecks are emerging that may seriously delay realization of the potential of big data in many, perhaps most organizations. 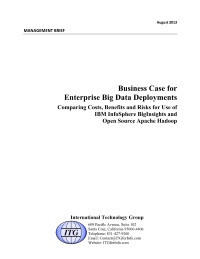 This is particularly the case for the complex of technologies that has developed around Apache Hadoop.